Oppo N1 (16GB) review | What Hi-Fi? You may know Chinese manufacturer Oppo for its pricey Blu-ray players, but recently it has been making waves in the smartphone market. The N1 is one of its first and stands out due to the company bundling it with the choice of two operating systems, both based on Android: ColorOS, Oppo’s own colourful skin over Android 4.2; and dev playground and Android tweaker’s dream, CyanogenMod. CyanogenMod allows you to customise your Android experience to the nth degree by installing features and performance enhancements not available on official Android releases. There’s a bit of techy know-how needed, but there’s a great community online to support you if you’re new to it. And don’t let the geeky name put you off – you can use CyanogenMod like any other version of Android and leave it exactly as it is when you install it. It looks and performs like the vanilla Android experience you’ll find on the Nexus 5 (although it’s currently based on Jelly Bean 4.2 rather than KitKat 4.4). Performance-wise, the N1 is no slouch, even though it has an outdated processor in the 1.7GHz quad-core Snapdragon 600 processor. However, it moved along with no lag or glitches during our test. The 5.9in Full HD screen does a great job with video; its 373ppi display making it among the sharpest devices we’ve tested. There are great levels of detail, with a good sense of depth and texture – all helped along by a natural colour palette, clear, bright whites and impressive blacks. Battery life will allow plenty of movies too, using just 10 per cent during a two-hour film. The N1 isn’t the most refined in its design. It’s solid and well made, but there’s wasted space below the capacitive buttons at the bottom of the screen. The space above the screen is on the chunky side too, but that’s because it holds Oppo’s rotating 13-megapixel camera, which can flip 206 degrees to take a much better selfie than its lower megapixel competition. It’s a great camera too, only just pipped by the Nokia Lumia 1520 for the very best in mobile snaps. Our test images were detailed with great colour and contrast. Even indoors, it judges artificial light well enough to ensure colours are reproduced correctly, though its lack of optical image stabilisation can mean a noisy low-light performance. 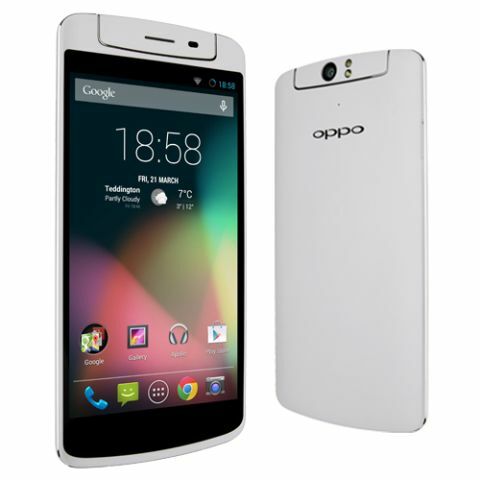 As for music, the Oppo performs well and is one of our favourite-sounding among the competition out there. What else? There’s near field communication (NFC) and Bluetooth 4.0, plus a touch panel called ‘O-Touch’ on the back, which can be configured for different gestures. However, multimedia power users might find the 32GB on-board storage with no microSD card slot a problem. It’s also worth noting there’s no 4G support here either, which makes it feel outdated already. It’s a shame, because the N1 surprised us as one of the strongest performers in many areas. But when getting hold of one isn’t easy either – you have to go online and buy it SIM-free – we have to dock it a star, despite a valiant effort from a very promising brand.